'DADDY FOX' is the second feature film by Manchester-based film director and producer John McCormack. Preparatory work on the film commenced in June 2000 and its first screening is scheduled for May 2001 at the Cannes Film Festival. General release should follow in autumn 2001. I was commissioned to do the production stills - these are behind-the-scenes photographs which document the making of the film, as well as pictures of the cast for promotional use. On 28 August I flew out from Manchester Airport with cast and crew for a week's shoot in Corfu. It was one of the best things I've done in my life. Here are some of the photographs I took. MARTIN HANCOCK, alias 'Spider' of Coronation Street, is the best known actor in the film 'Daddy Fox'. After two and a half years in 'The Street', Martin decided it was time to move on, and shortly after was given the part of Nick in 'Daddy Fox', his first major cinema role. Unlike 'eco-wimp' Spider, Nick is a tough guy who can box and knows how to use a gun. I was very impressed with the professionalism of Martin Hancock, who produced some amazing performances in front of the camera. Needless to say, he was recognised all the time by British tourists, and was pleased to sign autographs and pose for photos. He likes this part of the job, he tells me, and enjoys it when he can make someone's day by just sitting next to them on the train. Martin is originally from Acton, West London, but since joining Coronation Street, he's been based in Manchester. MALCOLM PITT plays Malc in the film 'Daddy Fox'. He's, one of the three lads falsely accused of murder, who flee to Corfu to escape possible wrongful imprisonment. Malcolm acted in John McCormack's first feature, 'The Van Boys', and also played in low-budget UK blockbuster 'The Full Monty'. It was only a small role, but it had a dynamic effect on his career, not only as an actor but as a singer. Multi-talented Malcolm Pitt has a superb singing voice, and takes his one-man soul act all over the country and abroad. He tells me he is most favourably received by audiences in Ireland, who warm to his half-Irish, half-African lineage. Malcolm grew up in Wythenshawe and still lives there today with his wife and three children. 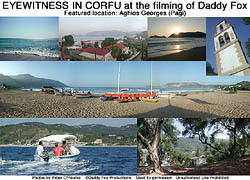 THE 'DADDY FOX' CORFU SHOOT was undertaken with a cast and crew of over 30 people. Here's just a small selection of the production stills I took, using the Nikon Coolpix 990 digital camera. Row 3: Beach shoot reflected in sunglasses of Jamie Summers, electrician; Greek dancing at dusk on the beach; Producer Roy Vernon in jovial mood; His daughter Charlene, runner#2, who also appeared in the film. JOHN McCORMACK is the director and producer of the feature film 'Daddy Fox'. He also wrote the script, which I'm told was revised many times before the final version was agreed on. Even this is changed when the director allows actors to improvise on set. Wythenshawe lad John McCormack worked as a fire fighter for nineteen and a half years, before leaving to pursue his film-making career full time. As well as the feature 'The Van Boys' he has also done promotional films for the North West Regional Development Authority. 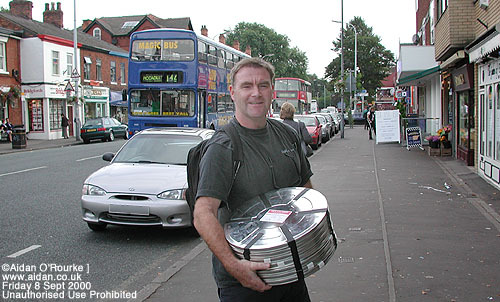 He masterminded the Manchester International Film Festival, which took place in May 2000. Most people will agree that the one of John McCormack's most remarkable gifts is to make things happen. 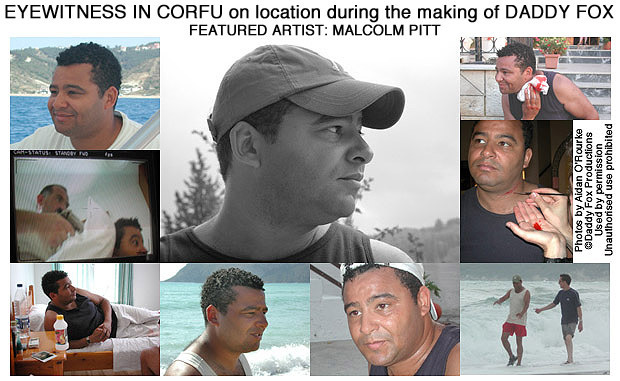 When he told me in June: "We're going to Corfu on August 27th or 28th", part of me didn't believe him. But as our British Midland Airbus lifted off from Manchester Airport on the evening of Monday 28th, we realised he'd done it - and all in the space of just 12 weeks. And John McCormack has another gift to which visitors to the Film Office in Didsbury will testify: He makes a great cup of tea. AGHIOS GEORGES is one of three towns of that name on the charming Greek island of Corfu. This one is situated on the north west corner of the island, not far from the village of Pagi. John McCormack and girlfriend Stephanie Bishop came here during 1999 and enjoyed their stay very much. With its beautiful scenery, carefree atmosphere and superb afternoon light, John thought that Corfu would provide an excellent contrast with Manchester for the film 'Daddy Fox'. In June 2000, he returned to plan the shots and in August flew out with a film crew and actors to shoot approximately one quarter of the film here. Aghios Georges is a two hour bus ride from Corfu Airport, which is three hours from Manchester by charter plane. And thanks to the film 'Daddy Fox' the town will forever be twinned with Manchester as the place where three lads on the run take refuge from the law. JOHN McCORMACK is seen here in Didsbury village on Friday 6th September 2000 holding the cans containing the Corfu footage of his film 'Daddy Fox'. The footage had just returned from processing in Leeds. In October and November 2000, the remaining scenes of 'Daddy Fox' will be shot, amounting to three times as much as what we can see here. During editing, all this material will be reduced down to a feature film of approximately 90 minutes in length. Though shot on film, 'Daddy Fox' is set to be the first feature-length movie in the world to be projected in the cinema using digital equipment. The premiere will take place in Cannes 2001 - see you there! 'DADDY FOX' may, just may, become the '4 Weddings' or 'Full Monty' of 2001, catapulting the people who made it, as well as Manchester and Aghios Georges, into the limelight. So remember where you saw it first! Soon I'll be publishing more photos and reports from the second part of the shoot, which will be taking place in and around Manchester in October and November. If you have any questions or requests concerning the film or any of the actors, please contact. And by the way, if you're wondering why it's called 'Daddyfox' well... you'll just have to wait until it's finished and watch it to the end!